HEY! HEY! I’M BLOGGING HERE!!! Sorry about that. Anyway, I’m back! And how appropriate that we left off at the shift from Old Hollywood to New Hollywood. You could say that Oliver was the last ‘Old school’ film to win, and now we’re in some serious cutting edge material. It’s the only X-rated film to win the big award, (and it came out in ’69. That’s irony.) but don’t let that scare you. It’s no worse than most R-rated films nowadays. Although, you may be a bit turned off by the subject matter. Joe Buck (John Voight) is a Texan moving to New York, hoping to make a career as a male prostitute. 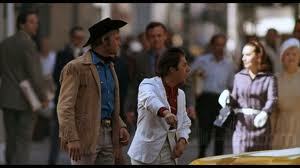 He’s helped out by a conman named Rizzo (Dustin Hoffman) who’s lived in New York all his life. And NYC has plans for these two men that will change everything. The tone of this film is hard to get a grip on. This film had doses of realism, classicism, and formalism. (look it up.) The editing has a somewhat disorienting pace to it, but in my mind, it works to the films advantage. It almost feels like every scene in the film is shot in the perfect way to shoot that particular scene. And it works because of the film’s underlying theme of the hustle and bustle of New York. I feel like it should be a convoluted mess, and yet, it’s not. Then we have the performances by Hoffman and Voight. It’s widely believed that the reason neither won Best Actor is because many people can’t choose between these two performances. For me, it’s Voight, but if Hoffman were nominated in Supporting, both would have walked away with trophies. They’re both spectacular performances, and they work off each other to a superb effect. This film has great atmosphere. And while it is a little on the long side, it manages to keep you invested all the way through. It’s actually hard to describe how much this film works. It’s a film with great writing, great acting, great directing, great editing, and great collaboration between everyone involved. Simply put, it’s one of the greats.